Char the serrano peppers in a pan, then pulse in a food processor. Toast each spice individually in a pan. Grind the spices together in a spice grinder and set aside. Add the washed and picked herbs to the chiles in the food processor with a splash of oil. Pulse a few times. Add the remaining oil and the ground spices. Run the food processor until the ingredients are mixed and the herbs are finely chopped. If serving the zhug right away, season with salt and plenty of lemon to taste. Otherwise, transfer the mixture to a container, cover tightly, and refrigerate for up to a month. Add the lemon and salt when ready to use. *Advanced home cooks: to replicate the true Renzo zhug, try fermenting the serrano peppers. Start by adding salt to the charred and processed chiles. Transfer to a container. Cover the mixture with a weight (plastic bags filled with water work well); anything that offers total surface coverage. Then place a cheesecloth over the container and let the chiles sit out at room temperature for about a month. This might sound like a lot of trouble, but multiplying the batch by five will provide enough fermented chiles to last all year; use them on any number of dishes. At 16, Evan Gaudreau began cooking in his hometown of Scituate, just south of Boston. While attending Emerson College, he helped open New England fare-focused Oro. Gaudreau continued his restaurant endeavors after graduation, working in several Boston kitchens until heading to the Culinary Institute of America in New York. 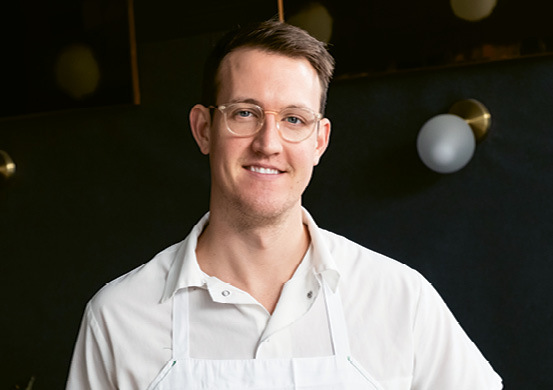 Since relocating to Charleston five years ago, Gaudreau has honed his skills at acclaimed, local favorites The Ordinary and Xiao Bao Biscuit. His friends, Faculty Lounge owners Erik and Nayda Hutson, asked him to join the Renzo team as chef in 2017. Gaudreau was eager to take on the challenge of perfecting pizza—a practice with which he held no previous professional experience. So far, so good, as the chef has been dazzling diners with clam-topped pies, roasted radishes, and wood-fired rigatoni since launching Renzo one year ago. ■ Crowd Pleaser: Gaudreau suggests serving a favorite roasted vegetable alongside yogurt, zhug, charred bread, and lemon at your next dinner party. ■ Verdant & Versatile: “Zhug is the perfect condiment for anything you want herbal and spicy, from sandwiches to whole roasted lamb shoulder,” says Gaudreau.